For IBM i use only. Specify that the exchange list capability is required. This will allow the EXCHANGE list capability in RPG, CL, COBOL, etc programs so that values can be returned from LANSA to these programs using the EXCHANGE command. Values can also be put on the LANSA exchange list from RPG, CL, COBOL, etc programs. Refer to the EXCHANGE command in the Technical Reference Guide for more details. Recompilation is necessary for changes to this setting to take effect. Allows permanent file overrides to be used. When you specify permanent file overrides you are telling LANSA that "every time I use this file, I really want to use this other file". This is useful when you want to use files with 10 character file names or files with a "." in their name, and so on. Refer to the The Permanent File Overrides Facility in the LANSA for i User Guide for details. Only relevant in an IBM i environment. Indicates that the IBM's Panel Groups are to be used for the presentation of user defined help text, rather than the LANSA help text display facility. Popup window to use OS400 window facility in 7.1.6 Display and Print controls must also be selected. Controls the use of Function Routing table X_FUNRTR from *LIBL. If this is not set, the Function Routing table in the partition module library will be used. Refer to What is Function Routing? in the LANSA for i User Guide for details. Specify that the system uses function level security. Note that using function level security increases overall system resource usage. Processes (NOT functions) compiled prior to a change to this value will ignore the change and should be recompiled. Yes specifies that end user process and function level security is disabled in this system. Disabling process and function level security improves system performance because no security checking is performed before accessing end user applications. This option has no effect on access to process or function definition details in a development environment. 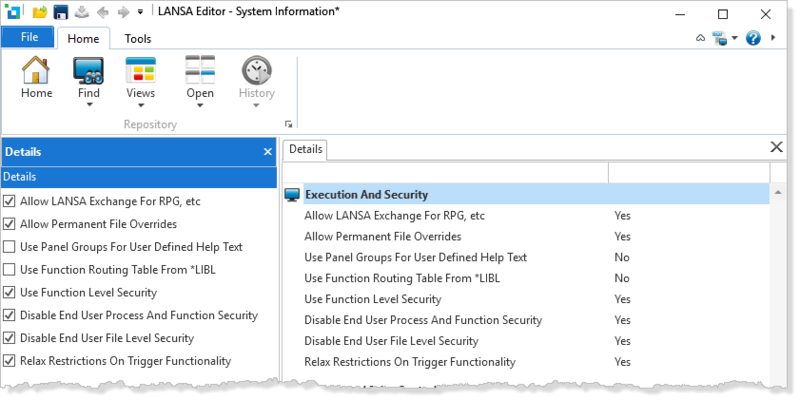 Yes is appropriate for installations that use an external menu system to control and secure access to LANSA applications. Additional security checking within the LANSA application is a waste of resource and may mean "double updating" of end user access rights. The option's setting is interpreted dynamically by all applications. Yes specifies that end user file level security is disabled in this system. Disabling file level security improves system performance, because no file level security checking is performed in end user applications. This option has no effect on access to file definition details in a development environment. Yes is appropriate for installations that use the approach "if the program is accessible from your menu .... then you can access all the files the program requires". The setting of this option is interpreted dynamically by all applications. Indicates that the normal LANSA rules that prevent database event triggers from calling other functions and using "user interface" commands should be relaxed. This use of this option is not recommended in most circumstances.